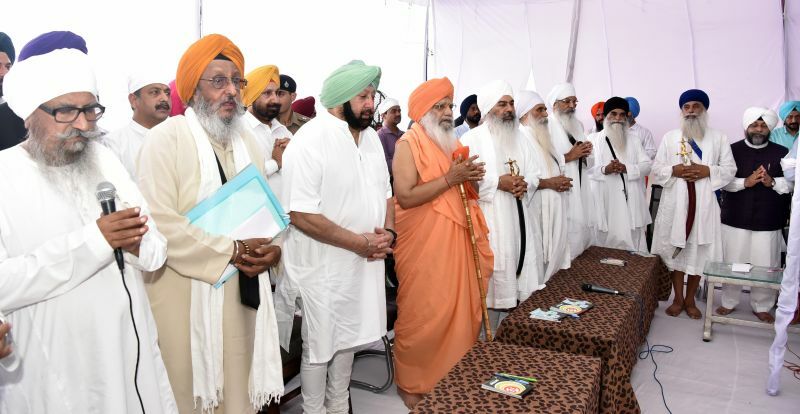 CHANDIGARH/SULTANPUR LODHI, : Punjab Chief Minister, Captain Amarinder Singh, on Monday sought the blessings and suggestions from the Sant Samaj for commemorating the 550th ‘Parkash Purab of Sri Guru Nanak Dev ji in a befitting manner across the globe. Interacting with the representatives of the Sant Samaj, the chief minister said that it was a matter of pride and honour for him that these celebrations were being held during his tenure. He said that his government will ensure that the celebrations are held in the most befitting manner and they had even sought assistance for it from the union government. The chief minister urged the representatives of Sant Samaj to give their suggestions and inputs for crystallising the concept and programs for the celebrations. The Chief Minister constituted a committee, comprising Local Government Minister Navjot Singh Sidhu, Cooperation Minister Sukhjinder Singh Randhawa and PWD Minister Vijay Inder Singla, for preparing the blue print for the mega celebrations. Captain Amarinder Singh said the yearlong celebrations will focus on Guruji’s life, his ideology, and his works, which till date continue to inspire millions across the globe. He said that the suggestions and recommendations of the Sant Samaj will be considered by the committee before finalising the blue print for the celebrations. He requested Baba Sarvjot Singh Bedi to form a committee of the representatives from Sant Samaj, which would keep in regular touch with the state executive committee to ensure meticulous implementation of final program.The Chief Minister apprised the members of Sant Samaj that his government will be celebrating various events at the historic places closely connected with the life of Guru ji. These would include Sultanpur Lodhi, Dera Baba Nanak and Batala, besides others. The Chief Minister said that on the suggestion of the state government the Prime Minister had formed a 36-member national committee under the chairmanship of Union Home Minister, with Union Finance Minister, CM Punjab, Union Cultural Affairs Minister and Principal Secretary Cultural Affairs as its members. He said former Prime Minister Dr. Manmohan Singh was also being consulted by the state government to chalk out the modalities and action program for these celebrations. Giving details of the schedule, the CM said that the Parkash Purab of Sri Guru Nanak Dev Ji would be celebrated on November 12, 2019. The State Government would initiate development works at the historical places, associated with the life of Guru ji, in the second week of November this year. He said that State had sought a special package of Rs 2145 crore from Centre. The projects envisaged by the state government include setting up of a National Institute of Interfaith Studies at Amritsar and a Rs 500 crore 500-bed Super Specialty Hospital at Gurdaspur in the name of Sri Guru Nanak Dev ji. Besides the government will be establishing a Heritage Village-Pind Babe Nanak Da at Sultanpur Lodhi at a cost of Rs. 200 and undertaking various development works. The Chief Minister said that the State Government had also constituted a three-member committee, headed by Vice Chancellor Guru Nanak Dev University, Amritsar, with Head of the university’s History Department and a representative of Shiromani Gurdwara Prabandhak Committee as its members, to suggest to the Government the roads, which were travelled by Guruji, so that they can be named after him. Emphasising the need to extend all possible assistance, facilities and adequate arrangements to Sangat in lakhs, which is expected to be gathered here to pay their obeisance on this historic occasion, the Chief Minister said that the State Government was already in touch with the Ministry of Railways, GOI for running Special Trains to these holy places from different parts of the country. Besides, a coffee table book is also being brought out on this sacred occasion to highlight the philosophy and teachings of Guru ji, who preached the oneness of God, harmony, brotherhood, compassion and truth to the humanity. Earlier while initiating the discussions, Baba Narinder Singh Ji Langran, flagged issues relating to accommodation, parking facilities, security, availability of drinking water, sanitation for the Sangat that would be visiting the state from across India and abroad. 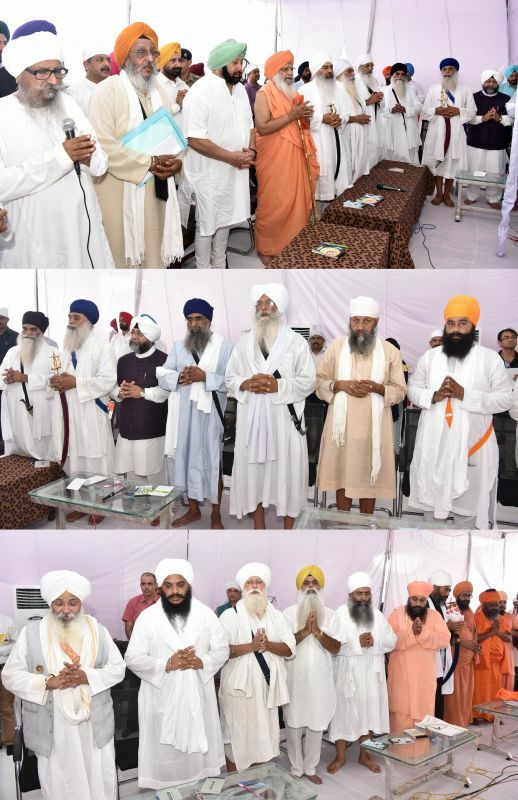 He also demanded that the road linking Phillaur, Nurmahal, Nakodar, Sultanpur Lodhi, Goindwal Sahib and Tarn Taran should be declared National Highway.Expressing his views, Baba Sarvjot Sungh Bedi, said that 550th Gurpurab should be celebrated in an exemplary way with a focus on disseminating the divine message of Guru Nanak Dev ji. Baba Balbir Singh Seechewal said that Guru Nanak Dev Ji’s eternal message, 'Pawan Guru Pani Pita Mata Dharat Mahatt', should be propagated in every nook and corner of the country so as to secure healthy environment besides ensuring ecological balance.Prominent amongst those present on the occasion included Local Government Minister Navjot Singh Sidhu, Co-operation Minister, Sukhjinder Singh Randhawa, PWD Minister Vijay Inder Singla, MLAs Navtej Singh Cheema and Davinder Singh Ghubaya and former minister Joginder Singh Mann. Sant Balwinder Singh of Rara Sahib, Sant Santan Nand, Baba Ram Singh, Sant Bhola Singh, Sant Chotta Singh, Sant Piara Singh, Sant Sewa Singh, Sant Kashmir Singh, Sant Sarup Singh, Sant Avtar Singh of Badhani Kalan, Sant Jasdev Singh of Lohat Baddi, Sant Jaiv Inder Singh, Sant Darshan Singh, Sant Balbir Singh Lamme, Bhai Gurikbal Singh, Sant Jaswant Singh, Giani Partap Singh Jhatthian, Sant Darbara Singh of Rohisar, Sant Baldev Singh, Sant Pritpal Singh, Giani Balwant Singh Nandgarh, Mahant Baba Kahan Singh Goinana Mandi, Sant Didar Singh, Baba Fauja Singh, Sant Jagjit Singh Harkhowal, Sant Balbir Singh Seechewal, Sant Baba Jagtar Singh, Sant Baba Sukha Singh, Sant Baba Gurcharan Singh, Mahatma Muni Ji, Sant Anbhol Singh, Baba Partap Singh, Baba Amrik Singh, Sant Baba Gurcharan Singh Sursingh Wale and Sant Baba Surinder Singh Subhane wale.